Special 'thank you' to Disney's PR company for inviting me an advance screening in exchange for a review. 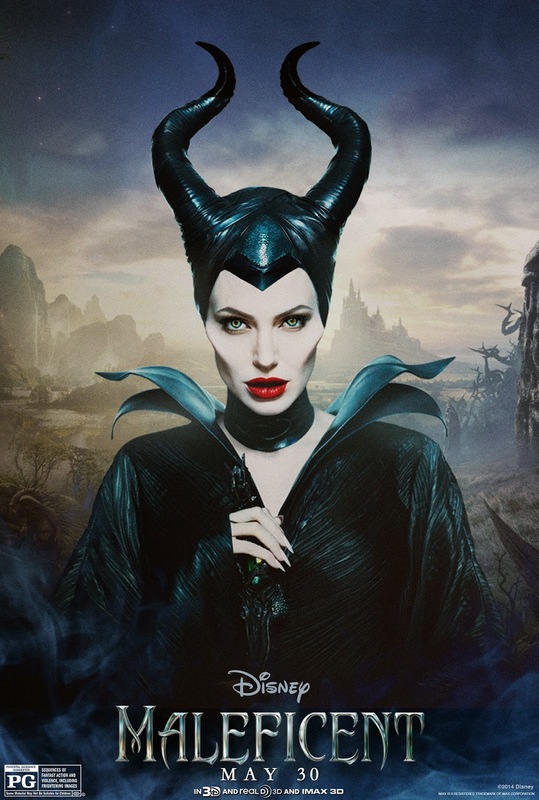 "Maleficent" explores the untold story of Disney’s most iconic villain from the classic "Sleeping Beauty" and the elements of her betrayal that ultimately turn her pure heart to stone. Driven by revenge and a fierce desire to protect the moors over which she presides, Maleficent cruelly places an irrevocable curse upon the human king’s newborn infant Aurora. As the child grows, Aurora is caught in the middle of the seething conflict between the forest kingdom she has grown to love and the human kingdom that holds her legacy. Maleficent realizes that Aurora may hold the key to peace in the land and is forced to take drastic actions that will change both worlds forever. I really loved this retelling of the classic Sleeping Beauty. With this version, viewers get to see Maleficent's story all the way from when she was a young, carefree fairy. I'd like to note that they did a great job casting Isobelle Molloy as young Maleficent! The movie starts out showing us the enchanted forest in which Maleficent lives (the Moors). In the Moors, there is no ruler of the fairies; each one is equal. As she gets older, Maleficent becomes a protector of the Moors because she is the biggest fairy. In the nearby castle, the current king places a huge reward on Maleficent's head and without giving away too much, she is betrayed and loses her glorious wings. The wings would solidify Stefan as the next in line to the throne. After this ultimate betrayal, Maleficent's anger changes her and she appoints herself as the ruler of the Moors. She also makes a servant out of Diaval (Sam Riley), which later turns to friendship. Once King Stefan's child is born, Maleficent places an irrevocable curse on her. The child (Aurora) will prick her finger on the spindle of a spinning wheel before her 16th birthday, making her fall into a deep, death-like sleep. As a twist, Maleficent allows one way for this curse to be broken. "True love's first kiss." This has more meaning in the movie than you know right now! King Stefan becomes frightened and orders the removal of all spinning wheels in the kingdom, but he also sends his daughter away to be raised by three small "good" fairies. Maleficent learns of the location and begins watching over her, somewhat as a fairy godmother. After almost 16 years of watching her grow up, she brings Aurora to the Moors and realizes she may be the key in bringing peace between the kingdom and the Moors. I will stop there as I don't want to give away too much of the movie and ruin things for others. I thoroughly enjoyed Maleficent! I loved the twist on the idea of "true love's first kiss" and I applaud Disney for changing that. I loved the dynamic between Diaval and Maleficent. He was made to stand by her because she saved his life, but in the end, he ended up as her best friend. The three fairies that were given the task of raising Aurora brought laughs which balanced the rest of the dark retelling of the story. I definitely want to see it again! Maleficent is in theaters today and is rated PG. Go see it, my little beasties! Right-hand man, Diaval and Maleficent. She will be thankful if you did lol! Honestly, I am not a huge Angelina fan (Team Aniston throwback!) but I loved the movie. It was not what I was expecting. Thanks, I was worried about that. Lol, I read a couple other review posts right now and I feel like one of them gave away too much. Mainly, the ending. I want to see this one too!! I have been waiting to see this! I cant wait! It was worth the wait, in my opinion! Thanks for stopping in. After seeing Maleficent, it makes me want to go and watch Sleeping Beauty again! :) I bet the two are so different. I haven't seen this movie yet! Thanks so much for sharing your thoughts on it, so excited to see it! I haven't thought too much into this move, but after reading this, I think I'm going to have to check it out! Great review! I've never seen Sleeping Beauty and I own it! I'm not an Angelina fan but she is one talented mama! Not to mention adorable Vivi making her big screen debut. Love! Yes, I agree; very talented. I'm so excited to see this movie. Thanks for the review! Yay, you're welcome! Thank you for stopping by! I can't wait to see this movie!! It looks so good! We went to that this weekend! How did you get invited to an advanced screening!? I need in on that goodness.